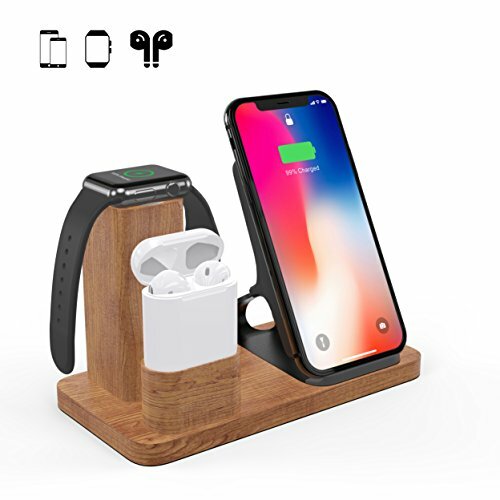 A Must Have for Apple Members - If you have two or more Apple products like iPhone, Apple Watch, Airpods and iPad, then this OLVOO 3 in 1 wood charging stand will be your favor. - It's convenient to charge Apple watch and iPhone, Airpods at the same time in one place - sturdy, neat and organized. - Nice neat solution for anyone who hates cords everywhere, now you have a chance to end your messy life. To Start Every Good Day with "100% Charged" - It makes it easy to charge your Apple products next to your bed, perfect for overnight charging. - Simply place down your iPhone X (or iPhone 8/8 Plus) no cables or USB interface required. Also compatible with any other Qi-enabled devices or devices equipped with a Qi-compatible cover. - The most fantastic point is an Airpods charging stand is added. Your AirPods case fits in top securely and a slot there to hold the case in place. - No need to assemble, plug in the line can be used, simple use brings endless fun to your life! ! ! - 12-month warranty. Please contact us on Amazon if any problems. 【3 in 1 Multi-function】 Working as a stand for Apple Watch, AirPods,cellphone Wireless Charger and Charging Stand. The best design angles hold your watch, phone, AirPods tight and sturdy, and perfectly hides your charging cables under the basement. It keeps your desk neat and tidy. 【Wireless Charger】- 10W Wireless Charger-2-coil design greatly increases the device charging speed. It is compatible with all Qi-enabled devices-It is specially designed for Qi-enabled cell phones(iPhone X/8 Plus/8/Samsung Galaxy Note 5 / Galaxy S7/S7 Edge/S7 Edge Plus/S8/S8 Edge/S9/S9 plus and so on)and iPhone 5/5S/5C/6/6 plus/6s/6s plus/7/7 plus(Additional Qi receiver is needed). 【iWatch Charger Station】-Compatible with ALL Versions of Apple Watch (Both 38mm and 42mm); Charger and Watch are not included. 【Airpods Charger】-Convenient design for charging Airpods. Special Hidden line design provides you a tidy charging stand. If you have any questions about this product by OLVOO, contact us by completing and submitting the form below. If you are looking for a specif part number, please include it with your message.